Daria Buszta receives her winner’s cheque from moderator Spencer Kelly and Transport Minister Baroness Kramer. Daria Buszta, an AS-Level student at Nottingham’s Bilborough College, was named the competition’s winner on Friday after impressing an expert panel of judges, headed by Transport Minister Baroness Kramer. 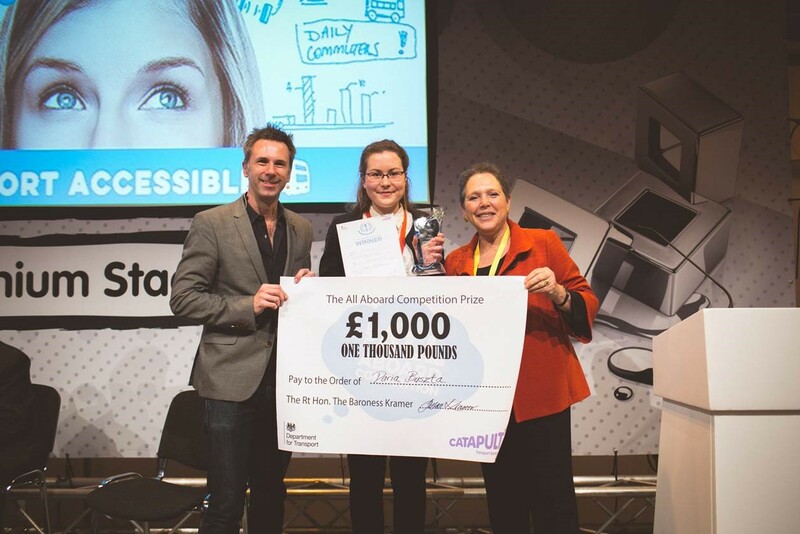 The 17-year-old science student from Nottingham will see her technology idea turned into a working prototype after winning the All Aboard accessible transport competition. “It was amazing,” said Daria, after receiving the All Aboard trophy, along with a winner’s cheque for £1,000, at the competition final held at the Birmingham NEC as part of this year’s Big Bang fair for young scientists and engineers. Run by the Transport Systems Catapult on behalf of the Department for Transport (DfT), the competition was officially launched by Baroness Kramer, Minister of State for Transport, on the 24th October. Competition officially launched by Transport Minister Baroness Kramer. More details and photos here. To read the transcription, please click here. This challenge supports the government’s wider Accessible Britain initiative, encouraging communities to become more inclusive and accessible. The challenge can be completed during class hours, after school or as a combination of the two. Teacher’s notes are available to introduce the competition and provide guidance on the challenge. Written submissions or videos describing the proposed solution are accepted as entry. The finalists will be invited to present their work at the Big Bang Fair 2015, where a panel of judges will decide on the competition winner.